For the geological formation, see Pediment (geology). A pediment is an architectural element found particularly in classical, neoclassical and baroque architecture, and its derivatives, consisting of a gable, usually of a triangular shape, placed above the horizontal structure of the entablature, typically supported by columns. The tympanum, the triangular area within the pediment, is often decorated with relief sculpture. The pediment is found in classical Greek temples, renaissance, and neoclassical architecture. A prominent example is the Parthenon, where it contains a tympanum decorated with figures in relief sculpture. This architectural element was developed in the architecture of ancient Greece. In ancient Rome, the Renaissance, and later architectural revivals, the pediment was used as a non-structural element over windows, doors and aedicules. A variant is the "segmental" or "arch" pediment, where the normal angular slopes of the cornice are replaced by one in the form of a segment of a circle, in the manner of a depressed arch. Both traditional and segmental pediments have "broken" and "open" forms. In the broken pediment the raking cornice is left open at the apex. The open pediment is open along the base – often used in Georgian architecture. A further variant is the "Swan-necked" pediment, where the raking cornice is in the form of two S-shaped brackets. The decorations in the tympanum frequently extend through these openings, in the form of "Alto-relievo" sculpture, "tondo" paintings, mirrors or windows. These forms were adopted in Mannerist architecture, and applied to furniture designed by Thomas Chippendale. The terms "open pediment" and "broken pediment" are often used interchangeably. A pediment is sometimes the top element of a portico. The 2000-year-old Pantheon in Rome, Italy. The previous abbey palace in Saint-Hubert, Belgium. The pediment and the dome of Panthéon de Paris. Nelson Pediment, Old Royal Naval College, Greenwich, modelled in Coade stone by Joseph Panzetta from a design by Benjamin West. 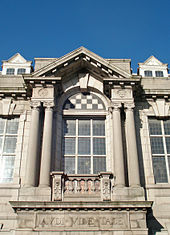 Wikimedia Commons has media related to pediments. Chisholm, Hugh, ed. (1911). "pediment" . Encyclopædia Britannica (11th ed.). Cambridge University Press.